Visitors to the High Line, the elevated park on a formerly derelict rail line, might someday be greeted by a vision even more improbable than the park itself, which has become one of Manhattan’s top tourist draws: A massive locomotive dangling from a crane. The sculpture, by Jeff Koons, would be a full-size replica of a 1943 Baldwin 2900 steam locomotive. Called simply “Train,” it has not yet been fabricated. The Los Angeles County Museum of Art has conducted its own feasibility studies for the project and is still exploring the possibility of acquiring the artwork, which is estimated to cost at least $25 million to create and install. But Mr. Koons, a polarizing artist whose most famous public sculpture is perhaps his 43-foot-tall flower-covered puppy, has recently been in talks with Robert Hammond and Joshua David, founders of the nonprofit conservancy Friends of the High Line. The group, which fought to save the railway from demolition and now manages the park, will honor Mr. Koons at its annual benefit in May. Mr. Hammond said that Friends of the High Line had long sought to highlight the park’s rail history. Once before, in 2008, the group considered the “Train” sculpture for a plaza at 10th Avenue and 18th Street, but the work was too big to fit there. The sculpture, to be constructed of steel and carbon fiber, would weigh several tons. It would also occasionally spin its wheels, blow a horn and emit steam. The one major obstacle is money. Friends of the High Line is focusing its energy on raising tens of millions of dollars to complete the third and final leg of the park. The last half-mile section, which hugs the West Side rail yards, runs west to 12th Avenue from 30th Street and 10th Avenue, and then continues north to 34th Street. Mr. Hammond said he hoped that a donor would step forward to sponsor the entire artwork, which could either hang permanently or for several years. In November, the city announced that CSX Transportation Inc. had agreed in principle to donate the third section of the elevated rail bed, allowing for the park’s completion. Friends of the High Line has been a magnet for high-profile donations. In October, the Diller-von Furstenberg Family Foundation announced a $20 million gift to the park. Barry Diller, chairman of IAC and Expedia, and his wife, the designer Diane von Furstenberg, had previously given $15 million to the High Line. Tom Eccles, former director of the Public Art Fund, a nonprofit group that organizes public exhibits in New York City, said he had followed Mr. Koons’s quest to execute “Train” and had once seen a model of the sculpture. “Like any Jeff Koons work, it is strikingly simple, ingenious and probably one of the most amazing things you’ll ever see,” said Mr. Eccles, who is executive director of the Center for Curatorial Studies at Bard College. One possible location for the sculpture is the northern end of the second section, at 10th Avenue and 30th Street. 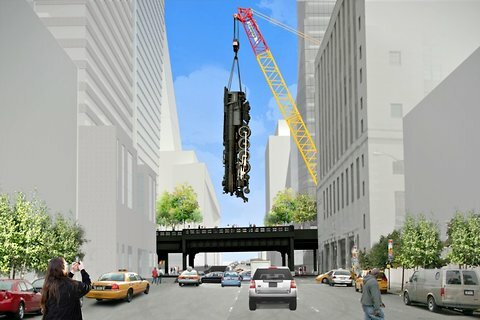 A rendering shows the 70-foot locomotive suspended vertically from a crane above the park. It is a potentially menacing image in a city that has had its share of crane accidents. But “Train” would employ a gyroscope to stabilize the sculpture to prevent it from swaying. Mr. Hammond speculated that Los Angeles and New York could both eventually wind up with Mr. Koons’s train replicas, an idea he found appealing. “There’s some symmetry in this sort of transcontinental rail idea,” he said.